Victor Pemberton is a well established author and playwright who over the past 45 years has contributed to iconic cult series such as ACE OF WANDS, TIMESLIP, TIGHTROPE and of course DOCTOR WHO. He has also written prolifically for radio, and this volume brings together five of his most celebrated radio scripts; complete with original notes, deleted scenes and alternative lines. THE GOLD WATCH: Victor Pemberton's first script for radio, produced in 1961, is based on the extraordinary circumstances of his father's retirement. 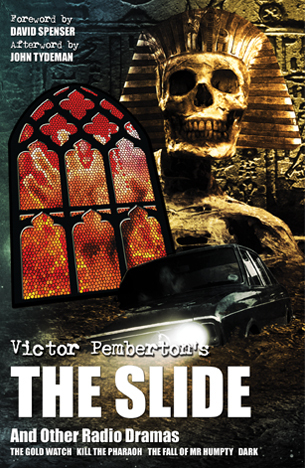 THE SLIDE: One of Victor's most famous radio plays is this supernatural thriller from 1966, originally featuring the vocal talents of Maurice Denham, Roger Delgado, David Spenser and Miriam Margolyes. KILL THE PHARAOH: An eight episode adventure from 1967, in which a London doctor finds herself plunged into a nightmare of international crime and intrigue on a holiday to Egypt. THE FALL OF MR HUMPTY: This "Nightmare for Radio" from 1975 starred Timothy West as a man who has a strange meeting on the last train of the night. DARK: A psychological supernatural thriller from 1978 which starred Honor Blackman and Nigel Anthony. Why is an American woman living in London constantly haunted by the spirit of her dead British husband. This collection of scripts is printed here for the very first time, spanning 380 pages, alongside newly written introductions by Victor Pemberton himself. Victor Pemberton wrote the 1968 Patrick Troughton story Fury from the Deep (which he subsequently novelised for Target Books). The story was based on his earlier stand-alone radio serial called The Slide (presented here), starring future Master actor Roger Delgado. Victor Pemberton was also story editor of season five opener The Tomb of the Cybermen. In 1976 Pemberton wrote the audio drama Doctor Who and the Pescatons. The story was heavily based on ideas Pemberton had used for Fury from the Deep. He later novelised The Pescatons, which was the final Doctor Who book published under the Target imprint. He also appeared as an actor in Doctor Who in a non-speaking role as a scientist in the 1967 story The Moonbase.